While USA Carry’s primary mission is to support and promote the concealed carry community across the United States, we’ve also talked a great deal about open carry and the challenges around it. We’ve covered the changing laws around open carry state-by-state, as a quick search of the site will confirm. Today we’re going to take it in a different direction and talk about open carry demonstrations, why folks take part in them, and some of the pros and cons of doing so. 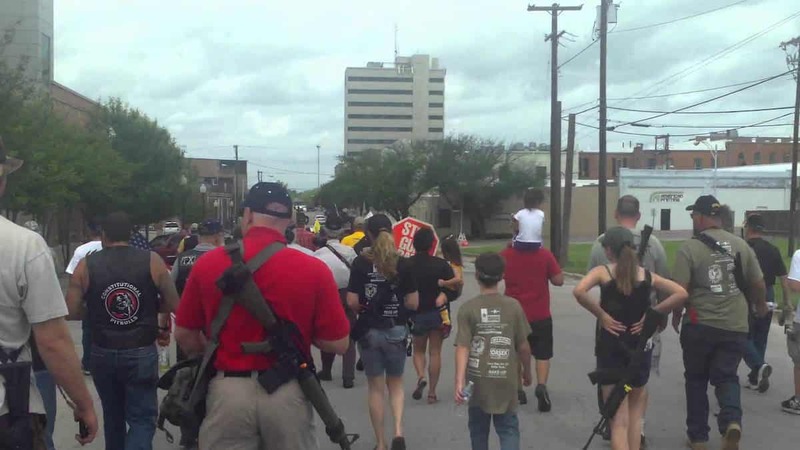 Open carry demonstrations or rallies come in many forms. Ideally, they’re peaceful gatherings promoting the right to keep and bear arms or protesting government overstep. This, to my mind, can be a good thing and fully in keeping with the Bill of Rights and the spirit of this great nation. However, there’s an uglier side to them: open carry demonstrations have a real tendency to come off as threatening or just plain scary to those who aren’t as comfortable around firearms. It matters because we’re dedicated to supporting our Second Amendment rights and ensuring that our traditions of shooting—for self defense, sport, or recreation—continue. In order to do so, we need to show the rest of the nation that we are the law abiding good neighbors we claim to be. In order to do so, we really need to think about how the messages we send will be received. Toward that end, here are some things to consider before organizing or taking part in an open carry demonstration. Pick your timing and location carefully. You want to be visible, but make sure that you’re doing so in a place that can’t be construed as threatening—that is, avoid being anywhere near a school, playground, or similar gathering place for families with kids. Likewise, avoid taking a large group to a place with a huge amount of foot traffic. This creates confusion, blocks pedestrian movement, and in general creates annoyance if not serious misunderstanding. Make sure you have all the relevant permits and that you follow the rules for their use. Respect both private business and public property. I would strongly suggest coordinating with the local police department, just to be on the safe side. I know that may feel like bypassing the Second Amendment, but sometimes we need to err on the side of caution. Have a plan and follow it. Know where you’re going to park, where you’ll rendezvous and hold your event, and how you’ll clean up and exit afterward. Whether you’re using public space or private property, leave it cleaner than you found it. And take care of your people, as well: have water and first aid available as needed. Talking with press and residents. You’ll probably end up having to talk to either the press or to residents who are curious about what you’re doing. That’s great! Take the opportunity to present your views and spread the word. However, do so in a respectful, peaceful, and friendly manner. We’ve discussed dealing with opposition to the Second Amendment in the past—all of that goes double here. You’re a large group of armed people; you have to be more friendly, polite, and courteous than average. Finally, and I’m adamant about this: avoid flooding a private business with a large crowd of armed people, particularly if you’re open-carrying long weapons. It’s a public relations nightmare; I guarantee that whatever your intention the media will turn it into a circus. It also forces folks who are just trying to enjoy lunch or coffee to be part of your demonstration. You absolutely have the right to open carry, but I’d argue that they also have the right to eat in peace. You had better be prepared to talk rationally and logically about your support for open carry. This will include learning a bunch of very dull statistics and reading some academic research. It’s not glamorous, but you owe it to yourself to have that knowledge ready to share. To sum up: no, I don’t oppose open carry demonstrations. I do think they need to be thought out and well planned, and that it requires a great deal of diplomacy. I hope you’ll take these words to heart. And if you do have any experience at an event like this, drop me a line. I’d love to hear all about it.